Global Travel Media » Blog Archive » Jasper’s First Ever Foodie Tour Is Taking Visitors on A Delicious Culinary Adventure! Jasper’s First Ever Foodie Tour Is Taking Visitors on A Delicious Culinary Adventure! 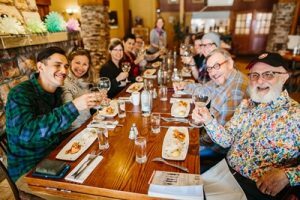 Since it’s beginning in May 2018, foodies and gastro-explorers alike have been indulging in a fun culinary adventure with the Jasper Downtown Foodie Tours, the first ever culinary walking tour through Jasper’s downtown core and growing rapidly in popularity. Exploring and learning about Jasper has never been so delicious. Meeting daily at 2:30 PM at the Visitor Information Centre lawn, the 3-hour tour brings guests around the town of Jasper sharing history while travelling between four local restaurants and visiting points of interest along the way. At each restaurant, guests will try a top dish and a perfectly paired boozy drink to experience the real taste of Jasper’s food scene. As guests cruise between each scrumptious stop they will be enjoying not only exquisite eats but some of Jasper’s tastiest tales by getting the rundown of the bewildering history of this spectacular mountain town. The goal? For each guest to leave full, in both body and mind, with memories and cravings for a lifetime!